The movie ‘Gimme Shelter”, a Ronald Krauss film, will premier in theaters on Friday, January 24th. It is a moving story of a pregnant teenager who leaves an abusive life with her drug-addicted mother to find her biological father. It is a story of survival, love and forgiveness. But mostly it is a story about a young girl who has made some bad choices and learns to live with the consequences. It is a story about choosing life — not only for herself but for her unborn child as well. I was honored to receive an early viewing of this gripping and true-to-life story. Here is what I think about the movie. These opinions are really and truly my own. The movie opens in the inner city with a young girl named Apple (Vanessa Hudgens) and her mother (Rosario Dawson) having a very physical argument. Apple eventually escapes the grip of her mother and gets into a car and rides off. From this point we see the challenges of a young girl living on the street as she searches for her biological father. Apple finds Tom, her father (Brendan Fraser) only to learn that his wife is not as accepting of her as he. To complicate the issue and to Apple’s surprise she is pregnant. Tom and his wife try to convince her that she is too young and ill-prepared to take on the responsibility of being a parent. Apple has an ultrasound and is presented with photos of her unborn baby — these photos become her dearest and most private possession. Soon after her ultrasound Apple’s step-mom makes an appointment, against Apple’s wishes, at “the clinic” so Apple can take care of things. At the clinic Apple reflects upon the pictures of her unborn child and makes the choice to run away, rather than go through with what is apparently an abortion, though that word is never used in the movie. Father McCarthy introduces her to Kathy Difiore (Ann Dowd) and from that point on the movie takes a turn to true hope. But Apple’s troubles are not over and you will have to watch the movie to learn more. 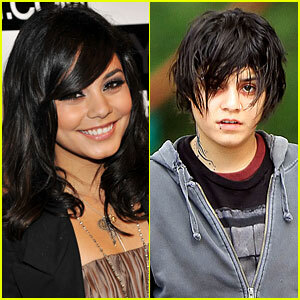 Vanessa Hudgens is totally transformed into an inner city girl complete with attitude and appearance. In preparation for this film Vanessa Hudgens lived among teen mother’s and their babies in a home much like the one that she lives in onscreen. It is so hard to believe that this is the same girl that played Gabriella Montez in Disney’s High School Musical back in 2006. She is totally transformed into an inner city girl complete with attitude and appearance — yet you see the little girl inside as she walks through some very, very trying life circumstances. Vanessa delivers an award-winning portrayal in this drama. To read more about the true story of the teen mother shelter on which this movie is based take a look at Homeless teen mother – True Story. This movie is rated PG-13 by the MPAA. I heard foul language in the first couple minutes during a scene that included main character Apple and her biological mother who was strung out on drugs. Also, during those first couple minutes there were quick scenes of scantly dressed women, again, all something one would expect in the environment in which Apple’s mother lived. Apple’s mother’s behavior was vulgar and selfish but very true-to-life. The rest of the movie presented nothing that requires caution. However, I highly recommend that if you plan to watch this as a family that the parents screen it first to determine at what age they would like their children to view this film. Overall, this film was gripping and at times very sad and happy. I challenge you to watch it without shedding a tear. It is very educational and may present a great opportunity to teach your family about the kind of stuff that happens in the real world when families are not surrounded by Biblical training and a wholesome Christian environment. It is also a great film to point out parallels to how God loves us so much that He gives us a second chance and presents us with the opportunity to make good choices. I liked the movie and I believe it will be on my mind for many days to come. It made me really praise God for His unconditional love and the Shelter that I have only in Him. Next post: What Is The Meaning Of The Christian Fish Symbol?